I was reading about the French Revolution recently and there was a group called "Estates General" that got together in time of national emergencies. The "Estates General" was 300 strong and consisted of three groups, 100 form the nobility, 100 from the clergy and 100 from the general population. What usually happened was the nobility and the clergy would ally themselves and impose their will on the general population. It seems to me the government has taken the place of the nobility and the "science" has taken the place of the clergy and they now collude to impose their will on everyone else. It would be wise for those in and close to the seat of power to learn the lessons from history. Actually, I believe that psychology holds the title of first post-modern science. All kinds of theories have been espoused for decades without reliable evidence or studies supporting them: Erhard Seminars Training (EST), scream and primal scream therapies, recovered memory therapy, sexual orientation conversion therapy, core energetics, dream analysis, etc. There are a few true climate scientists, but the recently expanded field is filled mostly with people who don't understand the scientific method, don't know the limitations and weaknesses of computer models, don't understand statistical methods and error limits, and don't understand the importance of skepticism (of their own work and the works of others). Evolutionary study is the first. Climate scientists modeled their approach after that. >>> The IPCC does not seem to be on a path to building the credibility of climate science. How do you build the credibility of a "science" based on consensus? When people see "peer review", they usually think of "scientific review", which is the detailed investigation of data and the replication of results by independent scientists. Scientific review gives some confidence that the claimed results are correct. Even then, conclusions about what the results "mean" can be totally wrong. Many of the scientists contributing to the IPCC (especially at East Anglia University) were committed to stopping scientific review. Despicably, they used their power of peer review to exclude criticism of their papers, and they refused to release underlying data to any organized scientific review. Fortunately, a few scientific bloggers were able to make many of the faults public. Amazingly, the IPCC didn't even restrict itself to peer reviewed results. The IPCC is a political institution, not a scientific one. Being half a scientist is like being half a truth. One reform would be to expect that journals list the papers that they reject for publication, as a matter of scientific integrity. This would hold the journals reponsible for their editorial opinion and their assumed gatekeeper role. They would be more careful and show less bias, with the journal's reputation on the line. It would be fine to go further and give the reviewer's opinions. This would encourage publishing pro and con views for rejected papers, and posibly for accepted ones also. OT: When I clicked on the link to this page (from Maggie's Farm), a pop-up appeared tellig me I had to log on and provide a password "which will not be sent unencrypted." It disappeared on the second attempt. Might be something weird going on. DrTorch: Evolutionary study is the first. Climate scientists modeled their approach after that. Meanwhile making alliance with every variety of skepticism. So, when someone equates evolutionary science with climate science, quiet acquiescence is the norm. Sure, there is great uncertainty in climate science, but the basic observations are clear. The surface and troposphere are warming, while the stratosphere is cooling, the signature of greenhouse warming. Post-modern science has a nice ring, but don't we already have a term for this? We should refer to this type of work as political science. I hear (read) what you're saying, but you're wrong. The first real post-modern science was social work. Gaunilo, I thought exactly the same thing. You can trace the decline in trust of the real scientists to the rise of political science. The smartest people coming out of college (real scientists) intermingling with the dumbest (political scientists) has not been good for the institution of science. Isn’t that great? It's how science works! Peer review is a good idea but it cannot substitute for reproducibility and common sense. Science is by definition a process, not a set of facts. "...the basic observations are clear. The surface and troposphere are warming..."
Can you say "Falsified", zachariel? And despite a steady rise in the [harmless and beneficial] trace gas CO2 [from only 0.00028 of the air, to a still-minuscule 0.00039 of the air], there has been NO global warming measured for the past 15 years. The obvious conclusion is that the "carbon" scare is political, not scientific. Any effect from CO2 is too small to measure. Global warming from CO2 is simply an unproven conjecture; a Post Normal Science opinion. It is doubly irritating when people like "zachariel" post such easily refuted nonsense. No one has ever been able to provide direct, testable, verifiable evidence showing any global harm from the rise in CO2. Therefore, CO2 is harmless: QED. On the other hand, satellite measurements show conclusively that the planet is greening due directly to the rise in CO2, an airborne fertilizer. With the federal government shoveling $7 - $8 BILLION in annual cash grants to "study climate change", that is a huge motivation to sound a false alarm. No scientist is going to get a financial grant for telling the truth: that nothing unusual is happening, and on balance, the rise in CO2 is entirely beneficial. Instead, they deliberately alarm the public for money. Despicable. Dr. Everett V. Scott: The long-predicted “tropospheric hot spot” [the so-called "fingerprint of global warming"] does not exist. The tropical tropospheric hot spot is not a signature of greenhouse warming, but a consequence of the adiabatic lapse rate due to any source of warming. Nor is clear that the hot spot doesn't exist. 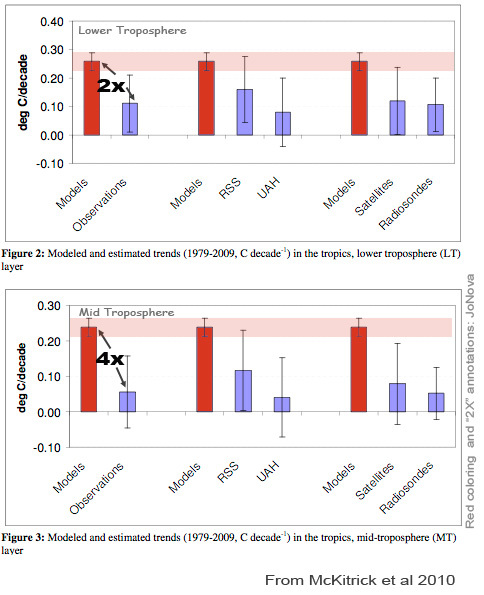 Santer et al., Consistency of modelled and observed temperature trends in the tropical troposphere, International Journal of Climatology 2008. Sherwood, et al., Robust Tropospheric Warming Revealed by Iteratively Homogenized Radiosonde Data, Journal of Climate 2008. Wrong denominator. Most of the atmosphere does not act to cause a greenhouse effect. Dr. Everett V. Scott: there has been NO global warming measured for the past 15 years. This is not a logical statement. As observed by others before me, the absence of evidence does not equate to evidence of absence. The correct answer is: Therefore, we cannot prove CO2 is dangerous. In fact, it can be directly demonstrated that CO2 at atmospheric levels inhibits both plant and animal mitochondrial respiration and enhances photosynthesis. Good or bad, depends upon what time of the day it is, what kingdom (whether you are a plant or a fungi) you’re from, what you like to eat for supper etc. the only way the "skeptic" line of thinking holds together is in you buy into a global conspiracy among scientific publications, scientists in many other countries and other governments. You have to keep expanding the list of those who "are in on it" to maintain an semblance of self-consistency. For instance, do folks think all of NOAA and all of NASA are in cahoots with the "liars"? how many people have to be in on the "conspiracy" to keep it plausible? or do we think we have a huge number of scientists who are also "skeptics" but keeping quiet? The other way the “skeptic” line of thinking holds together is if you assume there a lot of honest people with similar views and all too human biases who because of this bias happen to come to similar conclusions and act in a similar manner. The capacity of humans to make themselves believe what they want to believe is almost infinite and very scary. I’ve read numerous scientific publications which in one way or another support the ‘skeptic’ viewpoint so there obviously is no conspiracy or at least not a very effective one. It’s so very easy to ignore data which doesn’t fit your perceived ideas and emphasize data which does. For a system as complex as our climate, the opportunities to do so are almost endless. And this by the way is true for those on both sides of this debate. I have more, just ask. And these are real world data, not the computer model-based nonsense you're posting. All my links are based on empirical [real world] data. Face it: People lie using charts, just like they lie using statistics. The OISM Petition was co-signed by more than 31,400 scientists and engineers, all with degrees in the hard sciences, including more than 9,000 PhD's, stating that the rise in CO2 is harmless, and beneficial to the biosphere. Every co-signer's name has been cross checked and verified, and the original signatures had to be mailed in; no email petitions or copies allowed. You just haven't been looking for the tens of thousands of scientific skeptics, who far outnumber the relatively small clique of climate alarmists. If you got out of your mom's basement once in a while, you would see that all the nonsense about a global warming "consensus" is fabricated. In fact, the alarmist crowd has tried to get as many signatures on its own counter-petitions, but they failed badly, getting only a small fraction of OISM's. Like it or not, the "carbon" scare is on its way out, falsified by the ultimate Authority: Planet Earth. Steve D: The capacity of humans to make themselves believe what they want to believe is almost infinite and very scary. Which can apply to the so-called skeptics most readily. Steve D: I’ve read numerous scientific publications which in one way or another support the ‘skeptic’ viewpoint so there obviously is no conspiracy or at least not a very effective one. There are virtually no 'skeptical' papers that do more than touch on tangential issues. You seem to have missed a basic step in the scientific process. It is not the job of skeptics to prove that AGW theory is wrong. It is the job of AGW believers to prove that AGW theory is correct. You cannot just point to an glacier, scream "melting" and claim complete justification. You need some signature process that, if it happens, shows AGW theory is correct and if it does not happen proves AGW theory is wrong. Something that cannot be explained by any other theory. Also, remember that AGW theory makes several claims ALL of which need to be proved, most notably positive feedback. "So, when someone equates evolutionary science with climate science, quiet acquiescence is the norm." When you say "norm" I assume your claim is that 51% or more of AGW skeptics support creation science. Not in my experience, but I welcome your data. I agree completely and pointed that out in my previous comment. Perhaps I should rephrase that. There are plenty of good articles which suggest alternate theories for global warming or point out problems with the basic assumptions of the present CO2 theory. They don't usually advertise themselves as such, and would probably not catch notice unless the person doing the search was very well informed and very careful. Also, they tend to be published in geology or physics journals rather than climatology journals making them even less likely to stand out. Climatology is an observational NOT an experimental science. It has not yet reached the point where it can make accurate predictions. NormD: You seem to have missed a basic step in the scientific process. It is not the job of skeptics to prove that AGW theory is wrong. It is the job of AGW believers to prove that AGW theory is correct. We already mentioned this: The surface and troposphere are warming, while the stratosphere is cooling, the signature of greenhouse warming. NormD: When you say “norm” I assume your claim is that 51% or more of AGW skeptics support creation science. That's not what we said, but acquiescence, or perhaps simply quiescence. The greenhouse effect violates the laws of thermodynamics. The Earth may be warming, but not that much. The Earth may be warming significantly, but it's just a natural cycle. Humans aren't causing the warming. Humans may be causing the warming, but not that much. Among scientists, there's a methodology to determine which claims have merit. But among the so-called skeptical communities, contradictory positions often co-habit. Steve D: Also, they tend to be published in geology or physics journals rather than climatology journals making them even less likely to stand out. "Solar resonant diffusion waves as a driver of terrestrial climate change"
There are many forcings for climate, including solar irradiance, volcanism, orbital variations, continental drift, mountain building, variations in sea currents, changes in greenhouse gases, even cometary impacts. Nothing in that article calls into question theories of anthropogenic climate change. As we mentioned above, so-called skeptics claim that "Published research papers support the skeptical position, even though the authors make no such claim and hold contrary positions". Ehrlich actually teaches a course on how to bridge the gap between the climate science and public skepticism. "Although the consensus of climate scientists is that a significant fraction of global warming is human-caused, there is a rising level of public skepticism about the matter. How and why that skepticism developed will be discussed, and how renewable energy can be the bridge across the political chasm to deal with the matter in a way that is sound both politically and technologically." Yes, of course. Though the problem so-called skeptics have is with the historical reconstruction implying common descent and extensive and complex adaptation due to natural causes. Yes, the main one is called doing an experiment (and repeating it) to test a hypothesis. It’s why the conclusions of biochemists must by their very nature be more certain than that of historians. In biochemistry (which I admit to some bias since it is my personal field) you can actually do laboratory experiments. Unlike climatology, you can isolate competing factors, and address how each ones work, separately. While there are ways to mimic this in the observational science (like climatology) they are by their nature, limited and their conclusions are therefore less certain. So if what you are saying is that anthropogenic climate change is occurring alongside or on top of these other factors, then I have to agree. The issue here is their relative importance. In order to determine this you need a method to isolate each one of these factors in turn and in order to determine their overall importance you have to make the additional assumption that you have identified all of the major factors. If 90% or 1% or 0.1% of climate change is caused by humans then in each case you can certainly say your theory is validated. And I would be forced to agree. However, the implications of each figure differ enormously. You’re asking for a bit too much here from the researchers. We just don’t write the paper that way. First of all, it’s well known that negative or neutral findings are very difficult to publish in any field. Secondly, I think the data should speak for itself. Also, scientists are notorious for being conservative and may simply defer further speculation, wanting to avoid conflict or in some cases perhaps even not realize the full implications of their studies. I would prefer to say that published research papers simply illustrate how complex the issue is and how little we know about it. Regardless of the claims, climatology is a young and not (yet) predictive science for several reasons, but the difficulty of doing experiments with proper controls and the incredible complexity of its subject matter are certainly two of them. Note the huge range of predictions their models give; typical of a very early stage in any scientific field. Have you read any of Dr. Elrich’s books? His views on the subject of AGW are very interesting. I should add that in biochemistry which is an older science and much more experimental than climatology, contradictory positions also often co-habit for considerable periods of time. The complexity of the subject makes interpretation of often contradictory data difficult. It’s all in the interpretation, baby. When making even basic conclusions about living organisms from laboratory experiments or population trials is so difficult for me, do you understand why it makes me look at other sciences with a more jaundiced eye. Especially when their pronouncements are so confident, and the people making them seem to want to believe in them so badly. So when I see statements like: “models predict that the climate will rise from 2-6 degrees by the end of the century”; the range in this prediction takes my breath away. Given the relatively slow rate of climate change, the disparity between 2 and 6 degrees in this model is HUGE! That sort model would be considered useless in biology, not predictive at all. What types of factors change the prediction from 2 to 6 degrees? Why can’t they predict more accurately, say between 3 and 3.2 degrees? Because; there are too many unknown or poorly understood complexities. Just looking at the range of their predictions, without even checking on how good the models are performing, we can conclude that climatology has a long way to go. Steve D: Yes, the main one is called doing an experiment (and repeating it) to test a hypothesis. The experimental method is certainly part of the scientific method. But one can test a hypothesis through observation, as well. Steve D: It’s why the conclusions of biochemists must by their very nature be more certain than that of historians. There are many unknowns in biochemistry, but we can be pretty sure that dinosaurs once roamed the Earth. Or many areas of astronomy or geology or paleontology. Steve D: So if what you are saying is that anthropogenic climate change is occurring alongside or on top of these other factors, then I have to agree. Of course they do. The reason we're aware of these factors is because climatologists study them. Again, start with the basics. The surface and troposphere are warming, while the stratosphere is cooling, the signature of greenhouse warming. Yes with the twin caveats that 1) since you cannot manipulate the initial conditions, you have no proper controls and that 2) all observations are not created equal. Definitely, I couldn’t agree more (especially some of the nutty ideas proposed recently by astronomers). Actually, I would give climatology a clear advantage here since you are studying a phenomenon nearby in time and space and therefore your observations are more direct and less likely to be modified by unknown factors. First of all, that’s a hypothesis (the signature) not an established fact, that you are using to test another hypothesis (AGW). There is a degree of circularity to your argument. It’s nice that the two hypotheses fit together; if they didn’t that would be the end of AGW debate immediately. However, verifying a hypothesis by means of an established fact is a much better argument. 1)	What are the error bars on the data points? How confident are you that they accurately represent the global mean. 2)	Is 50 years of data enough to unequivocally demonstrate a signature? Without a control, how do we know? Also, I’m betting the instruments have improved dramatically over this time and have become more accurate. Comparing more precise data with less precise data is problematic statistically. If that’s not the case please correct me. 3)	Since about 1982 the temperature decrease in the lower stratosphere has stopped, completely. Actually, there may even be a hit of a small rise. That’s 25 years. Why? 4)	Since about 1997 or so the surface temperature has actually decreased. That’s 15 years. 5)	The temperature increase in the upper troposphere seems to be leveling off. It’s the same today as it was in 1980. It almost appears to be decreasing. That’s 25 years. 6)	The temperature in the lower troposphere shows an small but steady increase, consistent with the AGW theory. Of course I cherry picked my starting points, but starting in 1958 is just as arbitrary. To me it appears the most likely conclusion from your data is that AGW is actually occurring, but at a decreasing rate as time proceeds, as if some sort of unknown feedback mechanism is in operation. Data like this presented in other fields of science would generate a raucous debate about what it all means, not certainty. There is a lot more that could be said about the AGW signature. But just as an exercise, ask yourself what the signature would look like if the Earth's heating was internal (say caused by uranium, or external (say caused by solar radiation) and why. Then ask yourself if the water vapor in the earth's atmosphere is saturated in its ability to act as a GH gas. Then focus on the stratospheric temperature but only for the last 25 years. Steve D: Definitely, I couldn’t agree more (especially some of the nutty ideas proposed recently by astronomers). Without examples, we assume you mean speculative hypotheses, which are not conclusions. You claimed that "the conclusions of biochemists must by their very nature be more certain than that of historians." Yet dinosaurs certainly roamed the Earth millions of years ago, and biochemists can only guess whether and how an arbitrary amino acid sequence will fold in their very own lab today. Your point is irrelevant as to to whether there can be certainty within non-experimental fields. Steve D: First of all, that’s a hypothesis (the signature) not an established fact, that you are using to test another hypothesis (AGW). All scientific claims are hypotheses. The Earth moves is a hypothesis. Ordinary matter is made up of atoms is a hypothesis. A direct consequence of the greenhouse effect is a warmer lower atmosphere and a cooling upper atmosphere, predicted a century ago. The science of heat is quite well understood, but perhaps it is due to heat-faeries instead. Steve D: 1) What are the error bars on the data points? How confident are you that they accurately represent the global mean. We only need to determine the trend. We have millions of independent observations, ground station, radiosonde and satellite. Steve D: Is 50 years of data enough to unequivocally demonstrate a signature? Yes. Again, it's the opposing trends that matter. Steve D: Also, I’m betting the instruments have improved dramatically over this time and have become more accurate. Comparing more precise data with less precise data is problematic statistically. Climatologists are scientists, and like all scientists have learned to work with imperfect data. There are hundreds of studies, collecting data, analyzing data, determining the limitations of the data, then collecting new data by different means in order to gain confidence in the observations. Recently, the Berkeley Earth Surface Temperature project has completed extensive statistical analysis of the surface data verifying the trend. Steve D: Since about 1982 the temperature decrease in the lower stratosphere has stopped, completely. The stratosphere is distinctly cooler than in the 1980s, however, it has not cooled significantly in the last decade or so, probably due to aerosols. Solomon et al., "The Persistently Variable 'Background' Stratospheric Aerosol Layer and Global Climate Change", Science 2011. Steve D: Since about 1997 or so the surface temperature has actually decreased. That’s 15 years. That is incorrect. There has been significant warming in the last 15 years, even though you cherry-picked by starting the trend at the high point of a particularly large El Niño event. However, we can remove ENSO, volcanism and solar variations to see the underlying trend. Foster & Rahmstorf, Global temperature evolution 1979–2010, Environmental Research Letters 2011. Steve D: The temperature increase in the upper troposphere seems to be leveling off. It’s the same today as it was in 1980. It almost appears to be decreasing. That’s 25 years. Yes, it is not expected to warm as much as the lower troposphere, for the same reason the stratosphere is expected to cool. Steve D: The temperature in the lower troposphere shows an small but steady increase, consistent with the AGW theory. A lot of things can cause lower tropospheric warming, but very few things can cause lower tropospheric warming with stratospheric cooling. Steve D: To me it appears the most likely conclusion from your data is that AGW is actually occurring, but at a decreasing rate as time proceeds, as if some sort of unknown feedback mechanism is in operation. You didn't address the point. It's not the warming surface and troposphere, but the attendant cooling stratosphere that implies the greenhouse effect. Heat is being held close to the surface. Steve D: There is a lot more that could be said about the AGW signature. But just as an exercise, ask yourself what the signature would look like if the Earth’s heating was internal (say caused by uranium, or external (say caused by solar radiation) and why. Then the entire atmosphere would warm. Steve D: Then ask yourself if the water vapor in the earth’s atmosphere is saturated in its ability to act as a GH gas. The lower atmosphere is saturated with water vapor, but the upper atmosphere is not. Steve D: But just as an exercise, ask yourself what the signature would look like if the Earth’s heating was internal (say caused by uranium, or external (say caused by solar radiation) and why. Changes in solar irradiance are thought to be important for explaining many of the climate cycles the Earth has experienced. And certainly, the Earth's internal heat has been important in early epochs of its history. And all of these forcings interact in a complex fashion. A simple example is albedo. As the Earth cools, ice and snow form, increasing the Earth's reflectivity, causing further cooling, a positive feedback. As the Earth warms, ice and snow melt, decreasing the Earth's reflectivity, causing further warming, a positive feedback. This positive feedback may help explain the wide fluctuations in climate associated with ice ages. On a grander scale, CO2 is slowly removed from the atmosphere by geological processes. When the Earth plunged into a prolonged ice age, the posited Snowball Earth of the Cryogenian period, ice covered the rocks preventing this process of CO2 removal. Over time, volcanism increased CO2 until the greenhouse effect ended the ice age, a very slow negative feedback. On the subject of the experimental method, sometimes nature provides such an experiment ready-made. Volcanoes are such an example. This 'experiment' allowed scientists to narrow the uncertainty concerning climate sensitivity, that is, how much greenhouse warming is expected from a given increase in atmospheric CO2. Yes you can find cases where this isn’t true. Nevertheless, in general assuming phenomenon of a similar complexity, the experimental method is superior. And I’m sure you would admit that climate science is very complicated. On the subject of the experimental method, sometimes nature provides such an experiment ready-made. Sort of, but there is still the issue of controls to consider. What if a volcano irrupts but some other factor changes at the same time? I should have stated that the diagnostic feature of AGW (the trends) is an unverified hypothesis. So far as I am aware, you have no example where you pump in CO2 or another GH gas into a system, look at the stratosphere and then compare to an equivalent system where you don’t. Not if the greenhouse gasses near the surface are not saturated in their capacity to trap heat which leads me to my next point. That’s not the answer to the question I asked. Read it again. Yes, if you assume that both trends must have the same cause. Actually I did. My third point was about the stratospheric temperature graph. I am well aware that the cooling of the stratosphere is the diagnostic feature of AGW and as far as I can tell it is the only true evidence there is of AGW. I really get very nervous when an enormous theory is built on only single type of experimental evidence, especially when the trend levels off and another theory (aerosols) is brought forward to explain why. Now everything hinges on two hypotheses rather than one. So much can go wrong. 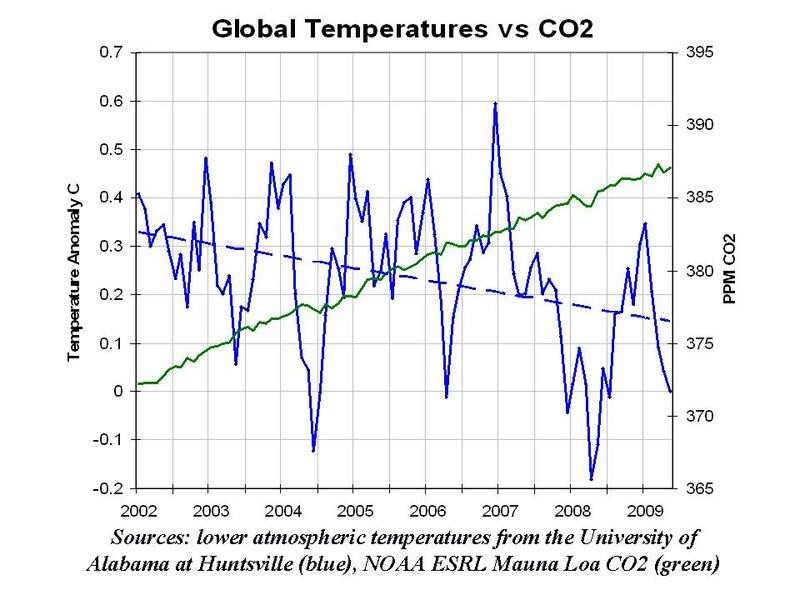 Other than the stratospheric reduction in temperature is there other evidence that the warming we see is caused by CO2? The paper states: ‘Several independent data sets show that stratospheric aerosols have increased in abundance since 2000.’ and then goes on a number of predictions about how aerosol levels will affect GW in the future. It will be interesting to see how these predictions bear out. But as I read through it, I notice that there are a lot of assumptions used to come to some of the conclusions and it’s difficult for me to evaluate how valid they are. I’m certainly not used to reading papers with so many assumptions. Even though I worry about special pleading their explanation certainly appears plausible enough. I can’t seem to link to the stratosphere graph, right now so I’ll hold my own comment for now – sorry, I know that’s your key point and I want to look at it more closely, after reading your comments on it, which I appreciate by the way. The increase in atmospheric temperature leads to an increase in CO2 since many biological and chemical processes which generate CO2 are heat dependent, then at some point the CO2 would trap the heat causing the stratospheric temperature to decrease. Pretty similar to the AGW theory except of course, the CO2 and GW are reversed in cause and effect. Steve D: Yes you can find cases where this isn’t true. Steve D: And I’m sure you would admit that climate science is very complicated. Of course. More specifically, it's a complex dynamical system. Steve D: What if a volcano irrupts but some other factor changes at the same time? Of course, but the eruption of Mt. Pinatubo was large enough to overwhelm other short term signals. Zachriel: The lower atmosphere is saturated with water vapor, but the upper atmosphere is not. Steve D: That’s not the answer to the question I asked. Read it again. Yes, and the answer looks appropriate to the question. Steve D: Yes, if you assume that both trends must have the same cause. And in reply, you offer pixie dust. The atmosphere is well-mixed over decadal periods. Do you have an alternative mechanism? Steve D: I really get very nervous when an enormous theory is built on only single type of experimental evidence, especially when the trend levels off and another theory (aerosols) is brought forward to explain why. Sorry, but climate science is "complicated". There are multiple forcings involved. Aerosols have an important role in how the atmosphere works; however, greenhouse warming is the predominate signal over the last few decades. Steve D: Other than the stratospheric reduction in temperature is there other evidence that the warming we see is caused by CO2? There are numerous studies in many different fields, from geophysics to forestry to oceanography, concerning global warming and climate change. That CO2, CH4, N2O and CFCs act as significant greenhouse gases is not in question, and the amount of greenhouse warming can be directly calculated. The important question in climatology is climate sensitivity, the amplification due to increased water vapor. There are multiple studies using different methodologies to determine climate sensitivity. Current estimates are 2-5°C per doubling of CO2, with ≈3°C the most probable, though there are still significant uncertainties on the upper limit. With most of these scenarios, one would have to be a lot more specific, and there are still many unknowns. None of this changes the overall signal of greenhouse warming currently observed. Sure, there might be a cryptic negative forcing that saves the day, but as more and more data becomes available, the more convinced climate scientists have become about anthropogenic climate change. Who should we believe? You, a wild-eyed climate alarmist? Or what Planet Earth is plainly telling us? There has been NO global warming for the past 15 years. None. CO2 is completely harmless, and beneficial to the biosphere. These are all verifiable facts, against your links to always-inaccurate, computer model-based conjectures. Who are you trying to fool with your nonsense? The planet is telling us the truth. You are not. Agendas are easy to spot. Hmm. I’ll try again. I was referring to the capacity of a single mole of water to trap or absorb heat. What I meant is that if you increase the temperature by an external source, say by solar radiation, will the water vapor (or CO2 for that matter) trap more heat and if so what percentage of it? Or is it maxed out with no more capacity to absorb heat so that must add more water to get more heat trapped? It’s perfectly valid for me to say that while I believe AGW is the best current theory, I still not overly confident in it. The amount of data is not the issue; it’s the type of data. If the trends in the data are real more data of the same sort will always seem to verify your theory. You need multiple independent lines of evidence, in order to rule out those pesky ‘cryptic negative forcings’ which crop up all the time, in order to ruin perfectly good theories. But are these studies describing independent lines of evidence, which connect CO2 specifically to warming and provide a line of evidence independent from the stratospheric temperature for the basic theory? Anyway they look like interesting so I plant to read them when I have a chance and thanks for providing them. I agree though, that to overthrow AGW, another acceptable explanation for the stratospheric cooling is necessary, regardless if the signal is small. My initial thought when I first saw the data was that it might be a natural long term process that started a long time before 1958. On the other hand that still could be AGW unless it went way way back. Loren: There is still the issue of no control. In other words, what would your line look like if there was no increase in CO2? Would there actually have been global cooling in that case? In other words, you can make the point there is no global warming because something else is masking the effect of CO2 - but that’s not really the point – the point is what would be the difference between the temperature of two identical earths, one with increased CO2 and the control earth, without (my definition of climate change). So for example, if the earth was about to go into a glacial period and the CO2 stopped it, that’s real climate change, (and beneficial). Zachriel’s adjusted data graph was an attempt to get to the bottom of that – eliminating ENSO and solar variation – I have issues with his interpretation but at least in principle it’s the direction climate scientists have to take since they can’t do the direct experiment (we only have one earth). What is the dotted line in the figure? As far as the surface data is concerned, from about 2002 or so the temperature looks constant. So the periods of stability are considerably less than I originally thought. However, there is still a distinct impression from all four graphs that the change is leveling off. That begs an explanation. So a signal exists but it is decreasing over time? Do you predict this is temporary and the temperature will take off into the stratosphere (pun/metaphor intended) again? Steve D: However, a fairer comparison to illustrate the difference between confidence levels for conclusions based on experiment versus observation might be to ask; are our conclusions about their basic metabolism (say whether they are warm or cold blooded) more or less certain than our similar conclusions about a chimpanzee’s metabolism? That just means that some conclusions are less certain than others. While, direct experimentation may have many advantages, it is quite possible to reach strong conclusions about historical claims. Did the Earth form billions of years ago, or 6000 years ago? There's probably a way to express your thought on this, though it seems to be elusive. It may not be important. More important is that each claim be judged on its merits. Steve D: What I meant is that if you increase the temperature by an external source, say by solar radiation, will the water vapor (or CO2 for that matter) trap more heat and if so what percentage of it? Or is it maxed out with no more capacity to absorb heat so that must add more water to get more heat trapped? Water vapor in the lower atmosphere is already opaque in the relevant spectra. Relatively small changes in the Earth's temperature shouldn't change the absorption significantly, nor would adding water vapor to the lower atmosphere. Steve D: One of the problems I see with modern science is that too often scientists assume that if A causes B and then if they see B, they assume A; not realizing that C causes A as well. Certainly sometimes. An abstract form of the scientific method is if A then B, B, therefore A is supported (but not proven because there can be other causes of B). This may be more of a problem when you can't directly experiment, turning A on and off to see what happens to B. By the way, given greenhouse warming, we still haven't made the link to human-activities. However, we know CO2 is a greenhouse gas, and various studies of climate sensitivity can now explain most of the warming trend, especially if we remove some of the known temporal fluctuations to see the underlying trend. Sure. Simple models of gene-to-protein have been superseded. Life was so simple then! Steve D: It’s perfectly valid for me to say that while I believe AGW is the best current theory, I still not overly confident in it. Of course. Most climatologists understand there is still uncertainty, though they are narrowing the range of what is plausible. Steve D: You need multiple independent lines of evidence, in order to rule out those pesky ‘cryptic negative forcings’ which crop up all the time, in order to ruin perfectly good theories. Perhaps they have confirmation bias, but the evidence seems to keep accumulating in multiple related fields. Steve D: But are these studies describing independent lines of evidence, which connect CO2 specifically to warming and provide a line of evidence independent from the stratospheric temperature for the basic theory? Some studies are just reporting on climate change associated with global warming. However, oceanographers are reporting on ocean warming and acidification. Satellite observations are strengthening the findings concerning climate sensitivity. Statistical studies tease data from imperfect historical observations. Paleoclimatologists are extending our understanding of past climate change. And so on. Like all valid scientific fields, the science interlocks with related fields. Steve D: I agree though, that to overthrow AGW, another acceptable explanation for the stratospheric cooling is necessary, regardless if the signal is small. Yes, an alternative explanation would be useful. One theory is that solar activity causes changes in atmospheric aerosols. Unfortunately, while it may partly explain historical climate change, it doesn't seem to work for the current climate trend. Steve D: However, there is still a distinct impression from all four graphs that the change is leveling off. That begs an explanation. Aerosols are still an important forcing, and may explain the slowdown of warming in the mid-twentieth century. At that time, the industrialized West was creating huge amount of aerosols. Today, China and other developing nations are emitting huge amounts of pollution. If this view is correct, then pollution temporarily slows the warming trend. They can't continue to pollute if they want to grow, as they are choking on their own industrial success. Understanding the relative weight of these forcings has been the work of the last generation. In the 1970s, a few scientists speculated that aerosols would predominate, but it became quickly apparent that the greenhouse effect would eventually tell. To FALSIFY the CO2=CAGW Conjecture [it is not a Hypothesis, because it can neither be tested nor falsified, and of course it is not a Theory, because it is unable to make any accurate, repeatable predictions], we only need to show that the steady, gentle rise in global temperatures since the Little Ice Age have NOT accelerated, as they must if CO2 has the claimed effect. And that is in fact the case. The planet is still emerging from the LIA, one of the coldest episodes in the entire 10,700 year Holocene. And it is emerging along the same trend line today as in the 1800's and 1900's, when CO2 was much lower. Lying with charts is comonplace. If you use a zero-baseline chart, it fools the eye with a chart artifact, falsely showing that recent temperatures are accelerating. They are not. The long-term temperature rise since the LIA has neither increased nor decreased. Thus, the ≈40% rise in CO2 has had ZERO effect on global temperatures. Note that when using a long term trend chart, rising temperatures remain along the trend. They are NOT accelerating, as they would have to if CO2 had the claimed effect. What we see instead is that the rise in CO2 has had NO effect on temperatures. NONE. The trend is exactly the same, whether CO2 is 280 ppmv, or 392 ppmv. The much higher CO2 level has NOT resulted in recent temperature acceleration, thus FALSIFYING the 'CO2=runaway global warming' Conjecture. And the pseudo-scientific nonsense that the rise in CO2 has miraculously exactly countered an approaching ice age is deluded Post Normal 'Science'. There is zero evidence for that rank speculation. As Occam's Razor says: the simplest explanation is almost always the correct explanation: CO2 simply does not have the claimed effect. You will falsify a conjecture that "can neither be tested nor falsified". In any case, here's a two thousand year reconstruction based on a number of different studies. Dr. Everett V. Scott: To FALSIFY the CO2=CAGW Conjecture [it is not a Hypothesis, because it can neither be tested nor falsified, and of course it is not a Theory, because it is unable to make any accurate, repeatable predictions], we only need to show that the steady, gentle rise in global temperatures since the Little Ice Age have NOT accelerated, as they must if CO2 has the claimed effect. You will falsify a conjecture that “can neither be tested nor falsified”. In any case, here’s a two thousand year reconstruction based on a number of different studies. By the way, given greenhouse warming, we still haven’t made the link to human-activities. I think you should get a pass on that one. It seems highly likely that the CO2 emitted is a major contributing factor to the increase in CO2 in the atmosphere, and if not…well it will have the same effect anyway. The first statement is a contradiction. How can you falsify something which cannot be falsified…? A lack of stratospheric cooling with no alternative explanation would definitely have falsified AGW. The opposite, its existence provides support but does not prove AGW. Both charts show the temperature rising about 0.4 degrees over the same time point. Dr. Scott’s graph does not go back far enough to make a conclusion. Still, even Zachriel’s corrected chart looks pretty linear to me, not accelerating. zachariel is so flustered that he is now double-posting. His Hokey Stick chart, from the Post Normal 'Science' Wikipedia nonsense, must be rejected out of hand as an artefact of a zero-baseline chart, as explained upthread. For any such long term trend, the proper chart is a trend chart. When a trend chart is used [as below], the pseudo-"hockey stick" effect disappears, because it is not real. As SteveD's own chart clearly shows, temperatures are not accelerating; something that MUST happen according to the runaway global warming prediction. Thus, runaway global warming is falsified by the ultimate Authority: the planet itself. Note that the trend is LINEAR. It is NOT accelerating, despite the 40% rise in [harmless, beneficial] CO2. NONE of the long term trends are accelerating. Therefore, CO2 CANNOT be causing any measurable global warming [I personally think CO2 may cause minimal warming, but it is so small that for all practical purposes it can be completely disregarded]. What I post is EVIDENCE [computer models are NOT evidence, nor are the climate alarmist, pal-reviewed, grant trolling papers based on models that are posted above by others. "Evidence" is empirical, testable, replicable DATA]. Dr. Everette V. Scott: His Hokey Stick chart, from the Post Normal ‘Science’ Wikipedia nonsense, must be rejected out of hand as an artefact of a zero-baseline chart, as explained upthread. There's nothing wrong with using a zero baseline. Dr. Everette V. Scott: As SteveD’s own chart clearly shows, temperatures are not accelerating; something that MUST happen according to the runaway global warming prediction. Why should it be accelerating? Few scientists think a runaway effect is likely at this point, though there is still some uncertainty over the longer term. Current estimates are 2-5°C per doubling of CO2, with ≈3°C the most probable, though there are still significant uncertainties on the upper limit. Also, it's hard to distinguish a linear trend from a geometric trend over short intervals, especially in a noisy system like climate. I couldn’t agree more – As a biochemist – I don’t know how many times the crystal structure model of a protein didn’t match the protein’s actual structure when it was finally solved. Our models for the growth and development of living organisms are even more laughable. The systems are too complex to model well. That’s why we do experiments. Pretty much. Although when I look at the charts carefully, there does seem to be a hint of an upsurge near the present on some of them. Is the line of best fit for these necessarily linear? You can’t just assume that and draw a linear line. Zachriel’s main point was the decrease in stratospheric temperature is evidence for AGW (that was actual data, not a model) – the basic signature of a greenhouse-effect warming. This does not necessarily imply any type of runaway warming of course, just GH gas-caused warming and in fact the graphs all looked like they were leveling off, possibly due to aerosols. So your charts do not speak to the cause of the warming only that there is warming and so far it seems relatively linear. I still don’t quite get how climatologists insist that increase water vapor cannot be the cause of present GW, but that their models predict increased water vapor will increase it. That the CO2 might be the major cause of the warming also does not imply that this will necessarily accelerate. In fact while the theory that water vapor will trap more heat is interesting, water vapor levels should increase to some degree or another, no matter what the cause of global warming – and that would lead to accelerated warming, again no matter what the cause. Think about periods of time in the past when the global temperatures were much warmer, and CO2 and water vapor levels much higher. It’s hard to imagine in these cases how the warming/increased vapor-CO2 cycle did not just spiral out of control baking the planet Earth and destroying all life. This suggests there is some type of negative feedback mechanism we don’t yet understand. ‘The important question in climatology is climate sensitivity, the amplification due to increased You said earlier that the atmosphere was already saturated with water vapor? An increase in temperature may slightly increase the saturation point and this will get filled up quickly by more water? This increased water vapor causes more warming which increases the saturation point further, allowing more water into the atmosphere – seems like runaway global warming to me since I can’t see any process stopping it. >>>> the only way the “skeptic” line of thinking holds together is in you buy into a global conspiracy among scientific publications, scientists in many other countries and other governments. You have to keep expanding the list of those who “are in on it” to maintain an semblance of self-consistency. For instance, do folks think all of NOAA and all of NASA are in cahoots with the “liars”? Larry, I realize you're a libtard idiot from other postings I've seen you make... but even for you, this is just ridiculously stupid. It doesn't require a wide array of people, it just requires the gatekeepers to collude. And that is an astoundingly small dataset. Moreover, there is a positive feedback element to CO2 -- it's in the money for the research. Since CO2-as-danger claims all call for vastly increased governmental powers and expenditures, the political preference is always going to be to favor those who agree. Once you start doing that, you start warping the studies being done because they're written to chase after the money, which is hardly small. Finalize the whole mess by turning charlatans and quacks who ignore the science and spout what's being pushed into celebrities, and vilifying anyone who disagrees with them. There are literally THOUSANDS and THOUSANDS of individuals with suitable credentials who doubt AGW for a number of reasons. They don't even get heard on the nightly news when they sign a petition en masse. Meanwhile, two quacks make a pro-AGW statement on a slow news day, and it gets international front-page 6:30pm coverage.